We are comprised of individuals from many United Nations NGO's, associated with both the United Nations Economic and Social Council (ECOSOC) and the Department of Public Information (DPI). Among them are: Operation Peace Through Unity, International Public Policy Institute, International Relief Friendship Foundation, The Ribbons International, Children of the Earth, Elizabeth Seton Foundation, Soka Gokkai International, Legion of Goodwill, Wittenberg Center, United Religions Initiative, Tribal Link, National Services Conference of the American Ethical Union, Aquarian Age Community, World Peace Prayer Society, Universal Peace Federation. Beyond that we are connected with the Global Alliance for Ministries and Departments of Peace (www.mfp-dop.org) and the U.S. Department of Peace (www.thepeacealliance.org) campaign (our co-chair is UN Liaison to these organizations). 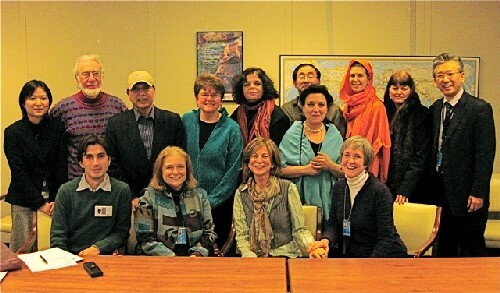 In addition, we have many consulting collaborative “friends” who are not official NGO members of CSVGC-NY but who support us -- such as the U.S. Peace Academy, the Global Education Association and Humanity’s Team and various distinguished UN officials. Our group started to slowly form during the mid-point of the decade around 2005, concurrent with the formation of its overall organization, the CSVGC-NY. Interestingly, one of our first tasks was to assist with the Mid-Decade Culture of Peace report but we were so new then that it did not occur to us to submit an entry ourselves. Below is how we are currently described on the CSVGC-NY website (www.csvgc-ny.org). This was revised two years ago and will be updated again -- as our mission and actions have developed considerably in an ever-expanding way since then. We have come to a deeper understanding and appreciation of the UN Declaration and Program of Action on a Culture of Peace (A/RES/53/243) during this time as our UN work has progressed. Perhaps a more precise description of our mission now is to simply promote this important UN document which is still under-utilized at the UN. Mission: To assist the United Nations in fulfilling it's mandate to "eliminate the scourge of war" by working in various ways to cultivate a culture of peace and pursue alternatives to violence at all levels of our existence (inner, inter-personal, national, international). We support structures that will enable nonviolence to become an organizing principle in society, where peace is regarded as a basic human right. and promoting the 10 Year World Report survey at the UN. •	In 2007 we presented a workshop during the week of spirituality on the peace of martial arts. •	In 2008 we had a more formal panel presentation to discuss “Is Peace a Human Right.” Featured were: Philippines Ambassador, culture of peace specialist, UNESCO culture specialist & Global Alliance representative. •	In 2009 we conducted a questionnaire on “Global Peace Through Reconciliation” which, among other things, asked various questions related to culture of peace and the concept of peace infrastructures. Its purpose was not only to assess level of civil society knowledge of these things but to educate and inform. We found most respondents supported ministries and departments of peace and passing a UN Resolution encouraging them. 3) Continue to support International Day of Peace efforts: The Global Alliance for Ministries and Departments of Peace selects the date of its biennial international Summits to coincide with the International Day of Peace. In 2007 it took place in Japan and 2009 in Costa Rica. We orchestrated a moment of silence during the 2009 Summit program (which was being broadcast globally) at the designated time when all around the world was to focus on peace. 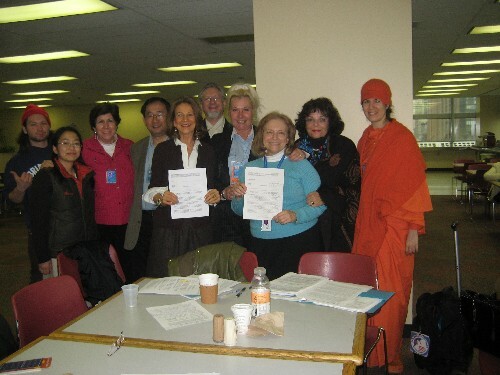 4) Increase UN recognition of new 10/2 International Day of Nonviolence: In 2009 we organized a presentation featuring a "non-violence" expert through the UN Values Caucus in recognition of this special new day on the UN calendar. 5) Obtain official UN DPI approval for Culture of Peace pocket booklet: We helped facilitate production of these handy little blue booklets (containing the actual UN culture of peace Resolution) that were made through the generosity of Soka Gakkai.International … who graciously makes supplies available to us for various distributions. 6) Consider ways to participate in the Annual NGO/DPI Conference: We presented a Midday Workshop at the 60th annual DPI/NHO Conference in September, 2007 on “A Solution to the Challenge of Climate Change: Global Alliance for Ministries and Departments of Peace.” We submitted a proposal for last year’s Mexico conference (which was not approved but we believe no effort is ever lost). We plan to try again this year to promote the culture of peace in this way. 7) Other: In 2006 we organized a presentation on the Global Alliance for Ministries and Departments of Peace through the UN Values Caucus. Yes indeed -- we have made amazing progress since the mid-decade! We have gradually evolved from a just a few NGO’s who merely resonated with the concept of “culture of peace” -- yet did not know much about it or what to “do” with it -- into to a group of passionate, dedicated “doers” consciously striving to operate from a spiritual base. Our list serve has grown from just a few to over 70! We have accomplished a variety of significant actions around the UN during the second half of the Decade too. The most dramatic example pertains to our work promoting this very Culture of Peace World Report effort at the UN!! We were able to get the Department of Public Information to read notice about it for the last two months at its weekly Briefings. This allowed us to develop a connection with DPI that had not existed before. Functioning within the concurrently evolving CSVGC-NY protocols, we have all come a long way in this time. 1) Lack of awareness and appreciation about the UN Declaration and Programme of Action on a Culture of Peace within the UN system and beyond. 2) The humungous UN protocols and vast bureaucracy one must go through in order to accomplish even the slightest thing. 3) Lack of funding to cover necessary expenses of our work, which have become quite costly and burdensome as our profile has enlarged. Bearing costs out-of-pocket is limiting plus can be a deterrent in recruiting volunteers to help. 1) Begin next phase of the draft UN Resolution project which is to visit missions to establish connection and begin dialogues on peace infrastructures. 1) Urge the Secretary-General to actively encourage all UN Member States to build the culture of peace architecture nationally – and in collaboration with the community of nations – by creating structures across national governments to direct policies and programmes in peace-building, and that these structures be in the form of Ministries or Departments of Peace, to support fulfillment of the vision in the UN Declaration and Programme of Action for a Culture of Peace (1999). 4) Reaffirm the United Nations pledge, as representatives of the governments of the world, to join “we the peoples” in building a peaceful, in the spirit of the UN Charter; advancing the culture of peace with each nation, each culture, each religion and each human being.